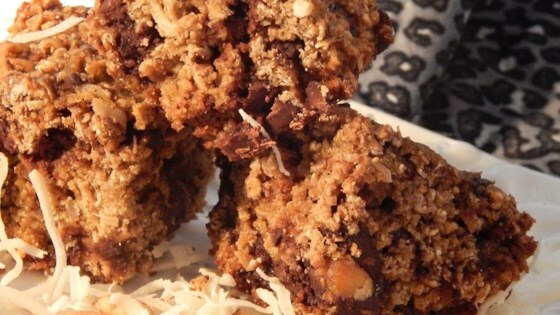 "This breakfast bar isn't too sweet, but it is a tasty treat for a morning snack. The use of the dark chocolate almond milk adds a nice flavor." Combine oats, oat flour, salt, and baking soda in a bowl. Add eggs, almond milk, brown sugar, and vanilla extract and mix well. Fold almonds, chocolate chips, and coconut into oats mixture; pour into the prepared baking dish. Bake in the preheated oven until set in the middle, about 40 minutes. Cool before cutting into squares. Add 1 cup of whole oats to food processor to make oat flour.